The pendant is a metal embellishment adhered to a 1 1/3" pine wood circle, 1/8" thick. I sprayed the wood with a clear, gloss sealer to protect it. It is on a 7mm jumpring and strung on nylon monofilament with small faux pearls and 3/8" wood beads. The pendant says Love. 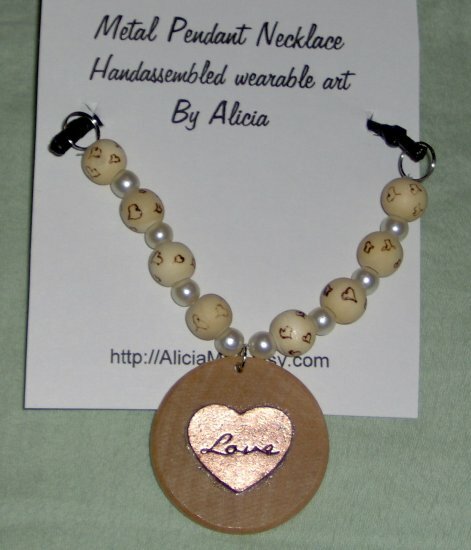 The wood beads have been hand burned with small hearts and sprayed with the sealant. The monofilament is attached to 1/2" silvertone split rings and black necklace cable. The clasp is a spring ring positioned for right handed operation. The necklace is approximately 24 inches in length.